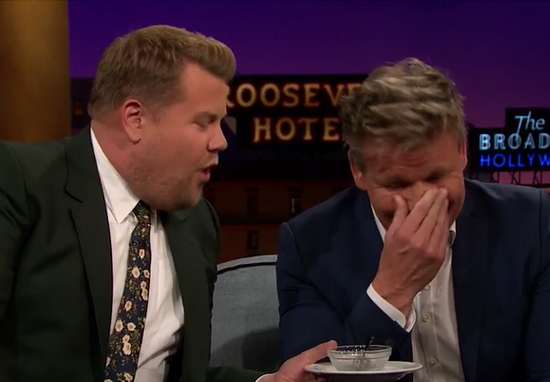 Gordon Ramsay making you eat a slimy fish eye on telly is pretty damn grim, and so we completely understand why James Corden would seize the opportunity to get revenge when Gordon appeared as a guest on The Late Late Show. Seven years ago, James and his family appeared on the grumpy chef’s TV show The F Word. This was James and Gordon’s first meeting and it would certainly prove memorable. A celebrity appearing on a Gordon Ramsay cookery show would usually expect to be wined and dined like a true star. James Corden on the other hand was pressured to scoop out and chow down on a fish eye, with Gordon promising the whole Corden clan a slap up meal at one of his top notch restaurants if James could follow through with the dare. However, Gordon never came good on his promise and the Cordens are still waiting on that posh dinner. You can see Gordon getting extra red and sweary as James and his parents give him a ticking off before a laughing audience. The angry cook is used to having a foul mouth, but this takes things to another level. Although, I didn’t see either man successfully chewing or swallowing, so as far as I’m concerned all bets are off.